There has been a change to the way Yosemite National Park issues wilderness permit reservations, and it is one that will make it much more convenient to apply. Your chances of getting the permit will probably decrease (more on that later), but it will be much less of an administrative nightmare. Here is the outline of the process. A 21-Day Window. The biggest change is that a single request will be good for three weeks of lotteries. (That, alone, might save you twenty iterations of trying to get your FAX through to the Wilderness Center). If it is your intention, for example, to hike starting around Labor Day, you could submit a request for a permit to enter the wilderness on August 26. If you don’t “win” the 26th, your request will rollover to the 27th. No luck on the 27th? Without any action on your part you get entered into the 28th’s lottery. This process would continue until September 15. If you don’t get your reservation on the 15th your request is no longer considered. Daily Updates. The park service promises daily updates. Once the window opens and your three-weeks of lotteries begin, each day you should get an email notification. If the notification is negative, you should expect another email the next day. If you get your reservation, you will stop getting emails. If you get twenty-one consecutive emails, and if the last is still bad news, your request will no longer be considered. Although I applaud this change, I’m concerned this will make it somewhat harder to get a permit. Here’s why: I suspect (and I have some data to back this up) that the majority of hikers in past years gave up after some number of FAXed requests; I also suspect that the number was much less than twenty-one. In my communication with readers I get the impression that after about ten failed attempts, a different alternative was considered. There are different reasons for that, including the difficulty of changing vacation dates and the unpleasantness of FAXing the request every single day. This new process eliminates the hassle of FAXing every day, but that hassle was an obstacle that eliminated some who were less committed (or less flexible). Even if the total number of hikers who make the request stay exactly the same, the number of hikers per day will likely increase, because of the automatic rollover. I think you are correct that it will increase the competition for permits. Under this new system a fairly casual hiker or group can all throw a permit application in there just in case they decide to go and have the automated process do the hard work of daily submission. With no hurdle to clear it levels out the highly motivated with the barely motivated. Perhaps that is more fair to all though. Of course, I don’t know if there is any system that would really make it easier to actually get a permit, since it appears to be simply a function of too many people vying for a very limited number of available permits. Thanks for the comment, Mark. Good insight. Ray, is this pretty much what you have to say about the new permit process in your book? I am having a devil of a time reaching out to you, Roleigh. I’ve sent two emails with the book attached, a separate email, and even posted in the Yahoo group. Not sure what I’m doing wrong, but it’s clear I’m messing it up somehow! I’m going to try to reach out again today. Is it possible my emails are going to some sort of “spam” folder? I’m curious how many permits will go unused. If you are issued a permit with a start day that you can’t use, is there any incentive to return/refuse it so someone else can take it? 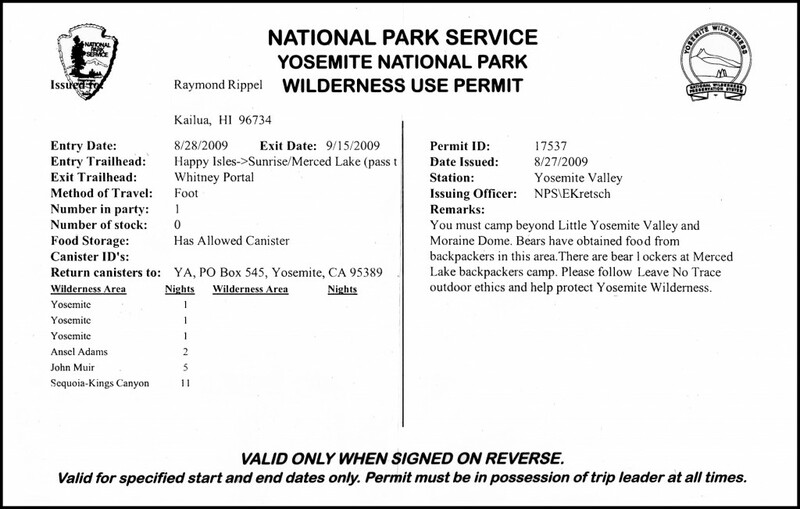 Unused permits can be re-issued on a walk-up basis, but I’m told by the wilderness manager that it rarely happens. Thanks, Trinka! Will we need to pay for the permit when applying? I was thinking the same thing, re: unused permits… I have a hard enough time arranging 2-3 weeks off from my full time job with a fixed start date. How can the wilderness manager say that it rarely happens when they have never used this system before? I suspect many permits will go unused, folks will somehow arrange for others to use their permits, and the number hiking without permits will increase. This benefits retirees, school teachers, and students, and bones the rest of us. Thanks for the comment, William. CC info is provided to be used IF you get the reservation. There is no charge to apply. I may have not been as clear as I could have in regards to unused reservations. What I meant to say is that IN THE PAST reservations have rarely gone unused. You may be right; with this new system there may be more of that. Hi Ray. So, for the sake of clarity… say I was to apply for a three week permit for July 1st. I arrange for one month off from work, which I have to do months in advance as one of my co-workers may grab those dates if I wait too long. If I get a permit for anywhere between July 1st and July 8th, I’m good to go. If I get a permit for July 15th, I can maybe do a two week hike. If I get a permit for anywhere from August 1st to August 15th, I can’t use the permit, yet I will still be charged for it? I misunderstood. My July 1st request would result in a permit being issued on July 21st at the latest. That would still leave me with only one week to do a section hike. If this is truly the case, I may just apply for a section permit from the outset, knowing I have a far better chance of it being approved, especially with family flying in from back east to join me. Thanks for your help with this. Good luck with the process, William, and know that whenever you decide to enter and exit it will be a great experience. Thanks for the comments. Thanks for the update Ray. I’m assuming this won’t officially start until the 2018 season? Nope…they intend to use this process this year. Thanks for the heads up. I got my application prepared in December ready to submit in February and probably wouldn’t have realised about this change without your post. My pleasure, Sarah. Good luck in the game! Kudos to you Ray for sorting this out and putting it in terms simple enough to understand. Last year our group of six tried for 30 days straight to get a permit from the valley and then gave up and registered the same day to go NOBO from Horseshoe Meadows. It added three days and some very enjoyable miles to our trek and a great time was had by all! Wow…thirty days! I have to admire your persistence. Glad you were able to see the sights, even if it was south-to-north. Thanks for the comment, David. Thanks for the update. I have 1 section to do in Yosemite, Tuolumne Meadows over Sunrise to HD, climb HD, then go up to Cloud’s Rest and exit at Tenaya Lake. I am hoping to do that the end of May or beginning of June, but it depends on when the road to T.M. opens. I am wondering what the chances of a walk-up pass would be. I have previously done the HI to LYV and HD. Just wanted to do HD again. Thanks for the question, Linda. If I understand it correctly, you would enter the wilderness at TM and not exit via Donohue. If that is correct, and if you are willing to get there early, a walk-up permit for one should be easy. Good luck! Thanks, Ray. Now a second question: For the OV to Whitney – where do I go to get a walk-up pass or what agency do I go to for the permit, and is it the same 6 mo in advance? The alternative would be to go in from the west on Bubbs Creek trail, then exiting at Crabtree Meadow or? I would check this post out: https://www.fs.usda.gov/main/inyo/passes-permits/recreation. I’ve never gone that way, but it sounds interesting. Thanks, Linda. Timely post, Ray! Some friends and I are planning to do a partial JMT hike this summer, and we are currently navigating the new permit process, along with figuring out everyone’s vacation schedule, last-minute gear buys, getting in shape, etc. Gonna be a fun adventure, even if we don’t do the whole thing. Personally, I’m using this as a training run for my eventual full hike….which keeps getting pushed, but remains on my to-do list. Thanks–as always–for good information and insights. Aloha! Thanks for the kind words, Bob, and good luck! Probably the best thing to do is to consult this chart: https://www.nps.gov/yose/planyourvisit/wildpermitdates.htm. Good luck, Kim. I know its been a while since this thread was active and maybe I can find the answer elsewhere. My question is, can I apply for the reserve permit everyday until I’m approved, regardless of being automatically entered into the lottery? Or do I have to wait until the full 21 days is up to reapply? Thanks for the question, Taylor. I can’t find anything that directly addresses this question, but clearly that is not the spirit of the process. By applying every day, after three weeks, you would have 21 different submissions. (Your submission from day 1, day 2, day 3, etc.) You are only allowed one. Hope this helps and good luck.